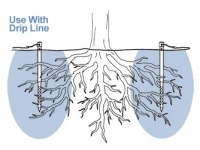 Deep Drip tree watering stakes help you to water and fertilise your trees and shrubs directly at the plant root. Watering at depth encourages healthy plant root growth, soil aeration and conservation of a precious resource. Available in 3 sizes and manufactured in ABS, the stakes are re-cyclable and strong. Multiple holes in the bottom of the stake covered with an internal mesh filter provides free passage of water to the roots whilst preventing any dirt or debris entering the stake. Once installed watering can be provided by inserting a small dripper into the top of each stake as shown. Connect to a tap and if required a water timer and watering can take place fully automatically. 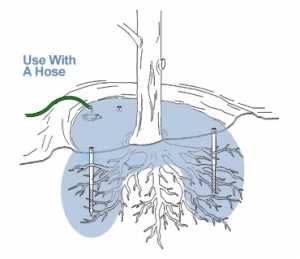 Alternativley, build a small bund around the tree and fill with water using a hose. The GreenWell is a great product to use in conjunction with the Deep Drip stake.